I've always wanted to ski in to work. Only in the past year have I worked close enough to home to make it practical. Today I finally got the chance. In honor of the UW's sesquicentennial, I followed the historic "Haute Education Route" to the university from my home in Maple Leaf. The ski in was very nice. Good kick and glide on my nearly antique XC skis. Nice TR. 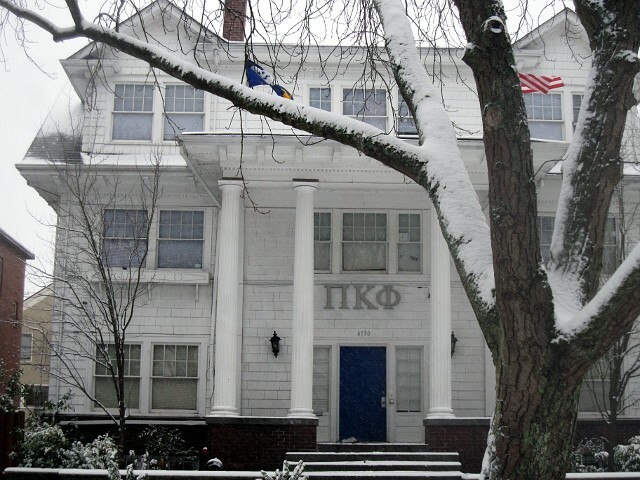 Makes me think I should go to campus tomorrow, just to see it covered in snow. Did you dig any pits? That's great Lowell -- this time last year I skied to a physical therapy appointment a few blocks from my house. It's always fun to see the city from the kick/glide/hum of the fishscale skis (my XC gear is not quite the wax-vintage). Awesome! It reminded me of skiing to school in the Midwest. There was one big downhill section that we used to race down to the doors of the bandroom. We called that the Cross-Country route 'cause it was similar to our xc routes for track. I like your 'Haute Education Route'. Chances are repeats will be rare! Great TR and route choice. I have only taken the Low Route, down in the ravine (the Short Bus Route? ), which is has quite a bit more ups and downs, and probably was not so good after it got icy. 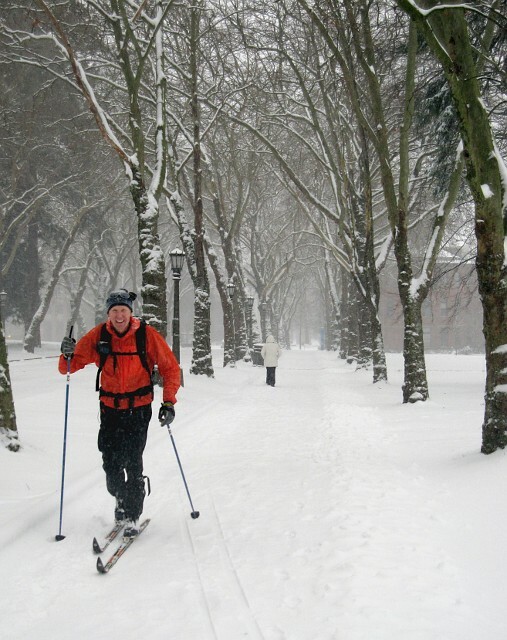 Ahh yes, one of my best memories of working at UW and living by the Burke Gilman trail, the four or five days of skiing into work during the 80s, 90s, and 00s. Way to continue the tradition. I love trips like these Lowell. Teanna and I have been extending our long weekend of skiing in Mazama here in Redmond - going on 7 days straight. I'm lucky to be able to work from home the past few days so haven't had to drive at all. Skiing in Farrel MacWirther, Pipeline Trail and Hartman Park getting better each day. Got to love grocery shopping with skis. Part of me envies those further east who can ski out their door all winter long. Looks like it might come to an end tomorrow. Did you have a photographer for your historic tour, Lowell? I'm even more impressed if you set those shots up via a timer. Excellent composition, and some interesting backgrounds to tell the tale. Well done. Did you have a photographer for your historic tour, Lowell?� I'm even more impressed if you set those shots up via a timer.� Excellent composition, and some interesting backgrounds to tell the tale.� Well done. For the fourth photo, above, I asked some passing students if they would hold the camera. The others were done with a gorilla pod and self-timer. Trips like this are such a novelty that I enjoy recording them. On a couple occasions I tied the gorilla pod to a tree trunk to get it up high enough. The picture taking probably doubled my commute time but the memories are worth it. Nice TR, Lowell. I was curious about how you did the photography too, and planned to post a question after finishing my own TR, but Jason beat me to it while I was writing. Thanks for the info. Nice! Thanks for the fun TR and extra effort to record it! What jacket is that Lowell? Looks like the new Montane wind jacket I just got and tried this week - works great for cold weather. It's an Arcteryx windbreaker. At least five years old. I like it because it's feather-light and at one time it did a pretty good job of shedding snow without being too warm. But the DWR treatment seems to be getting old and I was getting a little soggy by the time I got to work. I love checking out the site and finding gems like this. Thanks for posting. That's impressive that you executed those pictures so well. I got to ski to work Wednesday afternoon too -- the first time since Dec 1990. 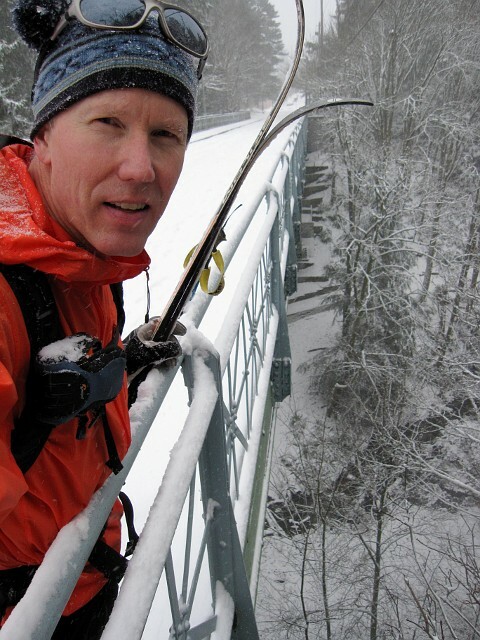 I skied from my home in Madrona to Lake Washington and then out to Sand Point (the Olmstead - Burke Gilman Traverse?) The skiing was surprisingly nice, especially on the BG Trail, which was quite skatable. I've always said that if you can ski in Seattle, the conditions are good. The ski home at 5 am Thursday morning might have busted that theory. A surprise ice storm, made worse by the sinking feeling that I had just finished my night shift as a forecaster. Doug - nice shot at the cut. 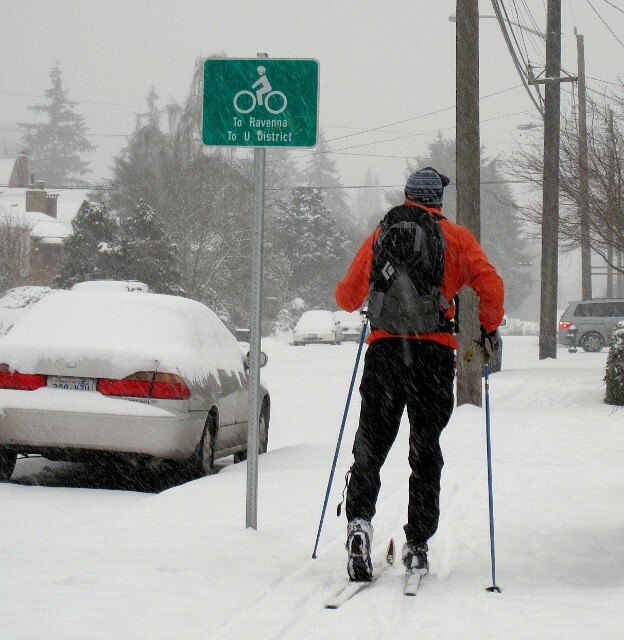 Is this the longest Seattle tour of the January 2012 storm? I've been auditing courses at the U just for the fun of it, and I was thinking of skiing to class... but I wondered about what to do with my skis once I got there. 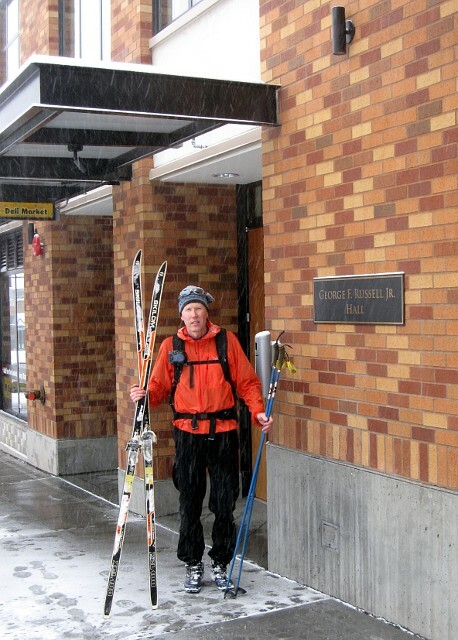 Where do I put my skis when I'm at the Suzzallo Library, or at the Parnasus? Where do I put them during a lecture? Up against the wall like people do with their skateboards?� Why are there no lockable ski racks on campus? ?